Have you been looking for a highly skilled and reliable garage that can carry out car repairs in Okehampton? Then be sure to choose the expert services of Okehampton Motors. 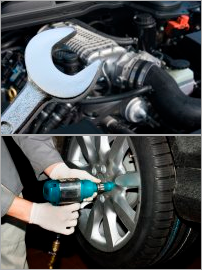 We are a friendly locally run garage which has been established for over 29 years, providing full vehicle servicing for both cars and commercial vehicles. We are based in Okehampton and cover all the local areas, offering our services to the general public as well as small to medium fleets. So if you're car or van is in need of new brakes in Okehampton, you really have come to the right place. If your vehicle has broken down or you require assistance, you will be pleased to know we also provide an excellent 24 hour recovery service for your convenience. If all the above wasn't enough we can provide a courtesy car if your car or van in for repair. FREE local collection and delivery is also available on request. We here at Okehampton Motors take great pride in the second to none garage services we have to offer, all our mechanics are fully trained and fully qualified with a wealth of knowledge and experience to rely upon. All of our prices are extremely competitive and we also believe that the customer is the main priority, which is why we always aim for 100% satisfaction with all the work we carry out. So, for expert car servicing in Okehampton, don&apos;t hesitate to call Okehampton Motors on 01837 54332, alternatively you can send us an email via the useful Contact Us page and we will get back to you as soon as we can. Remember, when you&apos;re searching for a company that specialises in accident repairs in Okehampton, make Okehampton Motors your number one choice today.